I have found that the best way to keep your presence consistent on social media is to schedule your content. Not only can you produce regular content without taking too much time out of your day but you can batch the tasks so you get it all out of the way in just a couple of hours a week! Why Should I Schedule My Social Media? Taking some time off? No one will ever know! So below are my favourite tools to schedule social media which I actually use and can totally recommend! 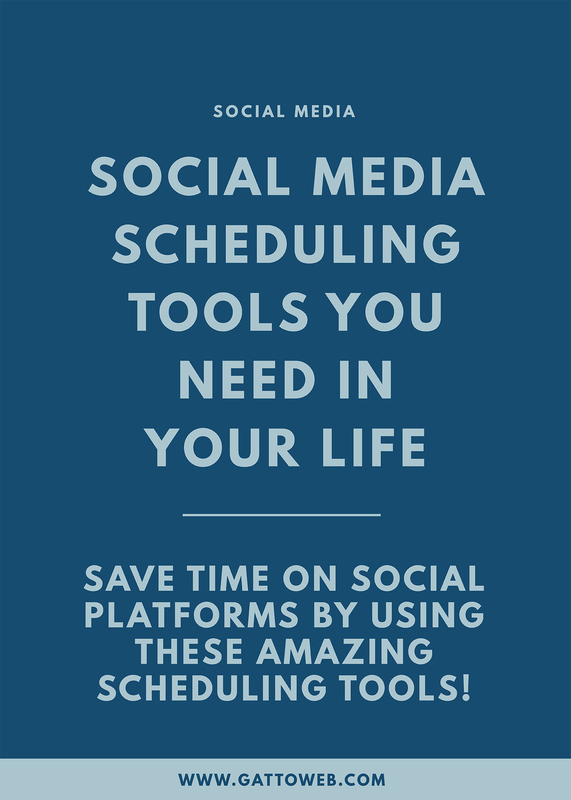 One of the most used and value for money scheduling tools is Buffer. I have been using Buffer for years, even going back to when I worked full time in social media and it is just a great all around social media tool. You can add several accounts including Facebook, Twitter, Pinterest, LinkedIn and more which means you can schedule everything from one little happy place! I currently use Buffer to schedule my Twitter and Facebook page as I have some other tools for the other platforms I use (more on that later) but it is perfect for those two as you just type in what you want to share, add an image and away you go! You can even set up your own custom schedule for each day to plan when the posts will go out. Pricing for Buffer ranges from a completely free plan with limited posts and accounts to $10 a month which gives you a huge increase in services and includes a super handy social calendar to track your content. There is also a plan catered for businesses if you are working in social media management and have quite a few clients. My favourite Buffer feature is the Buffer plugin for Chrome which means you can add any content you are browsing to your Buffer queue without even going to the Buffer page! Just click the button and schedule whilst you browse. After trying out various Instagram scheduling tools, I have recently set on my absolute favourite which is Planoly. Planoly is the nicest looking and most intuitive Instagram scheduler I have used to date and it offers a number of features which are really useful for business owners. As a designer, visuals are important to me so, yes, I am one of those people who plans her grid meticulously! Planoly makes this really easy as it has a grid planner which you can drag and drop to move around as well as a calendar nearby to plan when everything will be pushed out. I try to plan one post day, usually skipping Sundays and I just write up my captions and schedule the post for the best time and day. When that time comes around, I get a notification to my phone and then I can post my image. It takes no time at all! Planoly pricing ranges from $7 a month for a Solo plan which includes one account (this is what I use) up to $159 a month for a team and 10 accounts but there are packages in between depending on your needs for the tool. All paid plans include unlimited uploads so you can plan your content for the next few years if you want to! My absolute favourite thing about Planoly which pushes it way above any other Instagram tool is that it can be used on mobile and desktop. I much prefer working from my laptop so having a desktop version is essential for me. Although I do love the app for seeing how my feed will look on mobile once the content is posted. Another new-ish weapon in my armoury is Board Booster, a Pinterest scheduling tool which I discovered through the amazing Melyssa Griffin and her Pinfinite Growth course. Board Booster has completely changed my Pinterest game and made it one of my top referrers to my website. It has many different features all of which can be used to automate your Pinterest activity and grow your views from nothing! Of all the amazing features of Board Booster, the main two I use are the Scheduler and Looping tool which both mean I am producing consistent pins to my account. I schedule pins to all of my boards using secret back up boards which then go out a few times a day. This helps with the overwhelm of pinning 100 things at a time and annoying your followers! I then loop my boards so old pins are brought back to the top of the board and the content is always being reused. Billing depends on how many pins you use a month starting from 500 pins/month at $5 and moving up to 5000 pins/month at $50 if you do some serious pinning! However, I started on the free trial of 10000 pins and this lasts a while. I must say that out of all of these tools, Board Booster has helped me see the most growth on a social platform, going from 40 to over 600 followers and increasing my monthly views by 100k which is insane! You can’t complain with that.. If This Then That (IFTTT) is an amazing online tool which I would recommend for anyone, not just business owners. It works using Applets which are like little recipes that instruct your social media profiles or any other accounts to complete an action. This can be incredibly handy for cross-sharing on different platforms e.g. posting Instagrams to Twitter or sharing your latest blog post on Pinterest. There are literally thousands of Applets to choose from and so many accounts you can connect but I will stick to my social media activity. I use an Applet which tweets my Instagram posts with the photo attached (something which doesn’t happen if you share through Instagram) and I automatically share my blog posts to my social profiles. Another excellent applet is when I share an Instagram with the hashtag #pinterest, it adds the image to a Pinterest board – amazing! IFTTT is completely free unless you want to start publishing services and making Applets for which that plans start at $199. But otherwise you have full access to all Applets and services for absolutely no charge! Slightly off topic but I use a little Applet which recognises my location when I am out and about and sends a text to my other half when I am five minutes away – just in case he wants to be so kind to make me a coffee! So there it is, a breakdown of all the tools I use to schedule and manage my social media. What do you use? Are there any I should try out? * This blog post contains some affiliate links but I would never link to anything I didn't love and recommend!